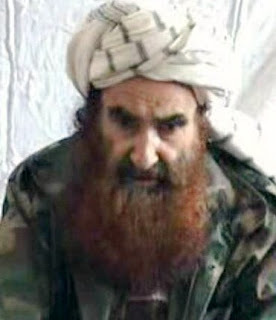 Here's Jalaluddin Haqqani, red beard and all. Remember, the Greeks, among others, made it to Afghanistan. I've been watching the unfolding Obama campaign, and reading the constant whining from neocon-land, such as this, and combined with his undoubted eloquence and charisma, these put-downs make me want to like the guy. 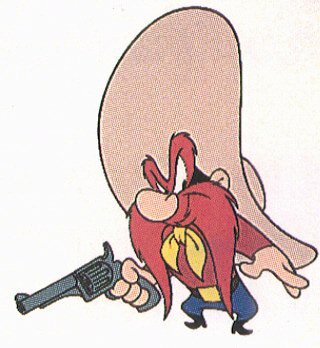 Plus which, as the Republican party has degenerated, in a two-party system, one tends to want to vote against the bad guys. However, as much as I kind of like the guy, and would rather listen to his elevated platitudes than W's lateral /s/, I can't bring myself to support him. Aside from his mechanical support for the whole social agenda and centralizing, egalitarian domestic politics of the left, his foreign policy is not the pansified surrender that the neocons suggest. In fact, the "Citizen of the World" who wants us to be concerned with Burma, Darfur, Zimbabwe, and God knows where else, is a traditional liberal internationalist. He wants us to be concerned with the happiness and prosperity of everyone, everywhere, and to spend the money and send the military forces needed to make it happen. This view isn't very different from the militarized democratic messianism that W adopted after 9/11, except it's unmoored from realpolitik, from any sense of what the strategic interests of our country are. Iraq may have been a mistake, but at least there was a claim (partly false, of course) that it was of special concern because of oil and terrorism. The Darfurs of the world have no such significance. Whether BHO makes any distinction between humanitarian concern and the national interest is not clear. What is clear is that he has not eschewed such quixotic nonsense as NATO expansion, the basing of troops in South Korea, and a monetary military commitment to an increasingly repulsive Israel, notwithstanding the paranoid rantings on contentions. What Obama has on offer, then, is a more multilateral, touchy-feely version of Wilsonian interventionism. Such a policy will not spare us from more useless expenditures on foreign aid, more kowtowing to the corrupt UN, and more war. Unless, of course, as Bush did in abandoning his aversion to "nation building," the man surprises us. I'd be the first to applaud. Parenthetically, McCain, with his "Bomb, bomb, Iran" jokes and his anti-Russian stance, is a dangerous man. If I lived in a swing state, I might have to force myself to vote for Obama. I live in California, now a Dem. slam dunk. I can vote for Bob Barr without fear or guilt, and hope agaisnt hope that Obama is a Manchurian candidate for non-interventionism. Nicholas Kristof is one of the better writers on the New York Times, and has not been shy in support of humanitarian causes. He's tumbled to the sordid truth about Israel, and has been on the receiving end of brickbats from Zionists--many of whom seem increasingly deranged to me. Of course, it could just be me. Here's his latest column on the subject, his blog post with comments, and his Facebook page. Even the Gray Lady can't be all bad all the time. His answer was definitive: “None at all.” I explained to him that humiliation by forced nakedness didn’t just happen to his friends: it is a longstanding problem in the Israeli military. HT: Velveteen Rabbi, who struggles with these issues. The full-blown lycanthropic yowling of some for an air attack on Iran is well-known in the media and the blogosphere, but considering the nature and extent of the threat, moral and physical, that such an adventure poses, it has not drawn enough attention. Much of the yowling comes from Jewish Americans who sympathize with the most aggressive and hysterical forms of Zionism. These are the people for whom any criticism of Israel is Jew-baiting (remember Joe Klein), the diverse world of jihadis is a single, monolithic enemy, and it is 1938 every day. They take the rhetoric of Iranian President Ahmadinejad as an expression of his intentions, and see no distinction between the interests of israel and the United States. They are, of course, a small minority of American Jews, who absorbed veneration for St. Eleanor and the slogans of liberalism at their grandma's knees. There are, of course, proponents of an aggressive war with Iran who are not Jewish and don't even particularly care about Israel, except as a strategic asset. (Despised in the region, Israel must tie itself to a foreign sponsor, first Britain and then the United States--hence it's a Mideast base of last resort). However, to give the agitation critical mass and effective rhetoric, it's the NoPods and the Krauthammers whose theme-development and writing are essential to the effort, in which exploitation of WWII genocide is constantly exploited. Pat Buchanan, although in some ways performs yeoman service, has to play bad boy and use the term "Fifth Column" to describe these circles, and if Israel were an enemy, and not just an over-pampered and too-influential ally. I have played the troll on Commentary's Contentions blog, attacking this notion and the constant lies used to promote and exonerate Israel. It's no fun commenting where everyone agrees with you. But it's a bigger deal than a few nasty exchanges. The United Nations Charter, to which the US is still, perhaps unwisely, a signatory, also forbids aggressive war. To bomb Iran, then, without an attack from Iran or the imminent danger of an attack, would not only be a mistake, it would be a crime. And the Commentary crowd are accessories before the fact. Psychopathology plays a part here. In most intellectual men there lurks the self-doubt--am I, a scribbler, really a man? Norman Podhoretz, the leading agitator for a bombing campaign, parlayed reminiscences about being beaten up by what used to be called "Negroes," into a literary career, and fame among a small New York coterie. For those who were converted to Zionism in 1967 or later, identifying with the image of the tan, tough, brash and ruthless Israeli is an anti-pansification salve. Instead of agitating for the murder of thousands to reassure themselves that they aren't wimps, here's my suggestion to these folks. Take a Viagra. Then take a Valium. Am I the only one out there that despises the Partnership for a Drug Free America and their stupid ads? They set my teeth on edge. Well, it's that time of year again (already!). Let's just start with the first proposition, that it is "self-evident" that "all men are created equal." It is evident that all men are not equal when it comes to basketball prowess, mathematical skill, and perfect pitch. What, then, doth "equal" mean? Equal in rights to participate in gummint? Jefferson may have proclaimed this equality as an ideal, but it was belied by property qualifications for voting, slavery, and if "men" is taken to be gender-inclusive, the limited rights of women. To rescue the proposition, we must retreat to some rather abstract notion of equal importance to God, rather like the mother who loves her slow and disobedient offspring just as much as her clean, obedient achievers. Not much of a proposition on which to found a nation, however nice a ring the words have to them. Next we come to natural rights and the reason for governments. I'll leave the "life, liberty" stuff to the reader, but it's pretty clear that governments in fact were not instituted to secure these rights, but to get organized to fight the guys over the next hill, or to make sure the Big Men kept more of the women and luxuries than the peasants. I love the country and the ring of the words, but like most truisms, their sound is more persuasive than their sense. Talk amongst yourselves, as Linda Richman would say.